Age-related changes in human cell-specific cytokine responses to acute illness have not been well examined. We therefore evaluated age-related differences in T, B and natural killer (NK) peripheral blood lymphocyte cytokine responses of 309 acutely ill hospitalized people in Malawi, Africa, < 1 month-61 years of age. We used four-colour flow cytometry and performed Wilcoxon rank sum and Kruskal-Wallis tests, Pearson (rp) and Spearman (rs) correlations, and linear and logistic regression analyses to control for human immunodeficiency virus infection (HIV) status, the percentages of lymphocytes expressing CD4, and the nature of the acute infection. 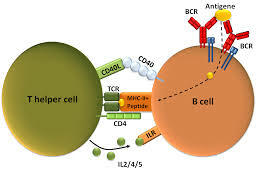 The percentages of CD8- and CD8+ T cells producing induced IL-8 decreased with age (rs = -0.44 and -0.53). The percentages of T cells producing TNF-alpha were higher, and the percentages producing IL-10 were lower, in those > or =13 than those < 13 years old (medians: 17.7 versus 10.5 and 1.4 versus 3.0, respectively). The percentages of CD8- T cells producing IFN-gamma were higher and stable in those > or =1 year old compared to infants (medians: 23.5 versus 10.4); the percentages of NK producing IFN-gamma were higher post-infancy and then declined to relatively low levels with increasing age. The percentages of T cells producing IL-2 were highest in those 5- or =31 years old (median 1.9). The ratios of the percentages of T cells producing IL-4 to those producing IL-8 and to those producing IL-10 both increased with age. These data suggest that innate immunity, represented by NK IFN-gamma production, dominates in early life. A number of shifts occur after infancy and before adolescence, including a proinflammatory shift from IL-8 to TNF-gamma and a type 2 shift from IL-10 to IL-4 dominance. These findings suggest distinct age-related differences in the human response to acute illness and may be useful in directing future efforts at immunomodulatory therapies.